It’s summertime, which means the mosquitoes are wreaking havoc on backyard barbecues and other outdoor fun. Perhaps you or a family member is a mosquito magnet and constantly battling the bugs, swatting and slapping away all summer. To be honest, summer can be downright miserable if you have allergic reactions to mosquito bites and endure swelling and irritation. 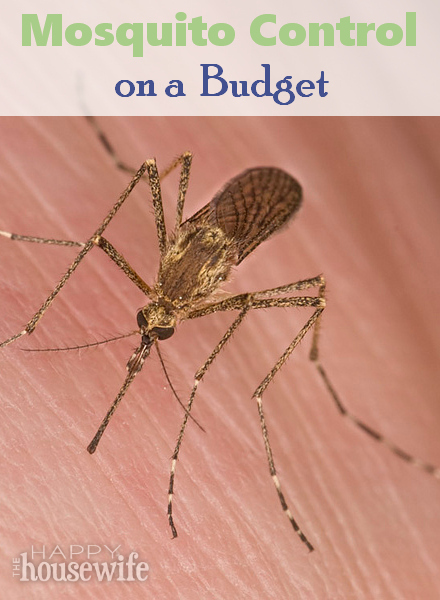 Below are some simple and frugal steps you can take to keep the mosquitoes at bay. Mosquitoes thrive near stagnant water, so it is important to make sure you get rid of standing water in your yard. That means tipping over yard toys, like wagons, that may collect rainwater. Mosquitoes need only a small amount of water, say a few tablespoons, to breed. Once mosquito larvae hatch, they don’t typically fly far, so standing water on your property could lead to a load of mosquitoes. Be sure to limit foliage, yard clippings, and leaf piles, where mosquitoes and other bugs like to harbor or feed. Keeping your landscaping trimmed and limiting ivy and junipers will decrease places where the mosquitoes can seek shelter. Mosquitoes are naturally repelled by a variety of plants. Fill your garden with plants such as marigolds, rosemary, catnip. citronella, peppermint, and garlic. If you don’t have the room for a garden in your yard, try some potted plants. Fragrances such as cologne and perfume can supposedly make you more appealing to mosquitoes. Avoid wearing scented fragrances when spending time outdoors for any lengthy amount of time. According to the CDC, the most effective repellents on the market today contain DEET. If you’re shopping for a repellent, look at the label to see if DEET is an active ingredient. You’ll find many of the big name brands that produce DEET repellents also offer manufacturer coupons during the spring and early summer, so check online and in your local newspaper inserts to save more money using their coupons. Since mosquitoes are not strong flyers, having an electric fan positioned on your deck, patio, terrace, or play area is an easy solution to the bug problem. The wind circulating from the fan should blow mosquitoes away from you, so they don’t have the chance to land. You can try your hand at creating your own citronella oil candles, which supposedly keep the bugs away for short periods of time. You can also try repurposing used dryer sheets to repel mosquitoes. Try these free and inexpensive tips to keep the biting bugs away this summer and take back your backyard! The best mosquito repellent I have found is rosemary essential oil. I use 40 drops in 2 oz. of olive oil or grape seed oil and apply to the bottoms of my feet or my legs as “lotion”. I use it daily all year around. I have had NO mosquito bites in EIGHT years although mosquitoes will still land on me and say, “YUK!”. < Blessings!